Add this spice to your Bloody Mary Recipe for some ono Hawaiian flavor. Back by popular demand! We’ve brought back one of our well liked specialty Bloody Mary seasonings. 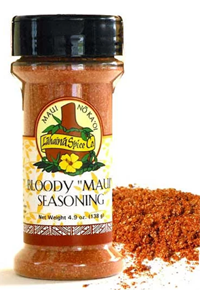 “Blood Maui” seasoning is a great spice to use as one of the main Bloody Mary ingredients. Impress your friends at your next party or gathering by adding this spice in your Bloody Mary recipe. “Bloody Maui” seasoning contains all the right ingredients for the perfect Hawaiian style Bloody Mary. The spice includes flavors such as sea salt, garlic, onion, Tabasco power, tamarind and more. Blood Maui Seasoning is a must have for any who loves Bloody Marys. Just sprinkle as much as you want in your Bloody Mary recipe and get ready for some one Hawaiian flavor. Purchase your “Bloody Maui” seasoning today. To see our full line of ono Hawaiian spice and seasonings visit Get The Spice.